This month, Speedy Tuesday turns 3 years old! Time for a little overview on the best read Speedy Tuesday articles from May 2012 till now. It all started with this post on Tuesday 29th of May 2012, about a Speedmaster Mark 4.5. We made it a recurring item and many of our readers (you!) chipped in as well. Besides the amazing quantity of e-mails we received with photos and stories of your precious Speedmaster watches, we also received some great guest contributions which we gladly published. Please, keep them coming! It doesn’t have to be a limited edition or vintage Speedmaster to be featured, just tell us why YOU chose an Omega Speedmaster as your wrist companion. And no, it doesn’t need to be a real astronaut’s watch either, any reason why you bought it will do. In our opinion, it is always interesting and entertaining to learn why people chose the Speedmaster. Use our contact form to get in touch with us. We always get back to you. So, time for a Top 10 Speedy Tuesday articles of all time. Or at least since May 29th 2012. Of course, articles that have been on-line since almost 3 years had more time to collect views and visits than last week’s Speedy Tuesday article, but that will sort itself out in time. Below our Top 10, starting with No.10 of the best read Speedy Tuesday articles since 2012. An evergreen and also one of our finest Speedy Tuesday moments. We actually found an astronaut’s Speedmaster that was owned by Austrian ESA astronaut Reinhard Furrer. The current owner approached us with this watch, not knowing exactly what it was and we helped him finding out more about it and its history. It was up for auction at some point later on, but retracted as a certain organization wasn’t too happy about it being on the market. Click here. This one actually surprised us as well to end up in our Top 10 Speedy Tuesday Articles overview. Not that it isn’t a great watch, but because it only seems to be something for those who can appreciate Speedmasters and digital displays. A watch for a ESA astronauts and a niche group of collectors. Click here. You will find Part 1 further down the road. That’s all we say. Click here. Introduced as Lunar Dust, but renamed ‘Grey Side of the Moon’ very soon after due to some copyright issues (as the story goes). A beautiful second version of Omega’s ceramic caliber 9300 Speedmaster models. We’d have a hard time deciding between this model and the Dark Side of the Moon, any Dark Side of the Moon model in the meanwhile. Click here. The watch that everybody expected to be introduced last year but no-one could foresee that Omega would make it like this. A limited edition Apollo XI (they do one every 5 years) that almost sold out immediately.One of the coolest Apollo XI editions in our book. Click here. In 2014 Omega introduced a re-edition of the famous Speedmaster Mark II (Professional) and not only did we review it, we also compared it to the version of 1969. Omega surely knows how to do a proper re-edition with a modern touch to make it interesting for today’s buyers, as purists probably will always go vintage. Click here. 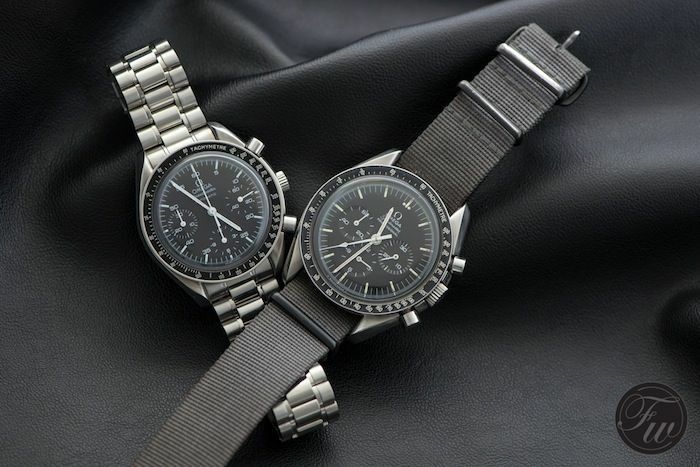 An article that compares an Omega Speedmaster Professional from 1967 with one from 2012. What happened to the design and construction of the iconic Speedmaster in those 45 years? This article explains and shows the exact differences between these watches. Interesting to those who are considering buying a Speedmaster but have difficulties deciding between a new or a vintage model. Click here. Written in the Italian sun August last year and already in this Top 10 Speedy Tuesday overview, this buyer’s guide for Omega Speedmaster watches. We thought – based on the questions we received per e-mail – that it was time to do a write-up on buying a Speedmaster. What to look for, which models are there, how about pricing etc. This article consists of two parts and we will come up with part 3 soon. Click here. As simple as that! We listed a number of possible straps you can use on your Omega Speedmaster Professional. Anything 20mm goes of course, but here are a few good suggestions, both OEM straps as well as 3rd party straps. In our monthly recurring Watch Strap Review feature you’ll find some more. Click here. An old but also an up-to-date question that people- who are interested in the Speedmaster watch – have is about the differences between the Speedmaster Professional ‘Moonwatch’ and the Speedmaster Reduced. Besides the size, there are a couple of more differences and in this article we explained them all. Click here. And that’s it! Our Top 10 Speedy Tuesday Articles overview since the early start of our recurring #speedytuesday feature. Also join us on Instagram (@fratellowatches) and make sure to tag your Speedmaster photos with a #speedytuesday hash-tag. In the meanwhile there are well over 8,000 images tagged with Speedy Tuesday. We will get back to you with a Speedy Tuesday GTG invitation for 2015 later on. Make sure to sign-up for our weekly newsletter, as we will publish the invitation there first.